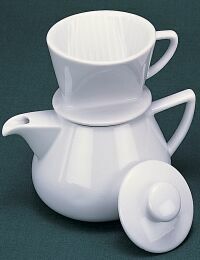 Porcelain cone filter (#1) sits on top of coffee pot for a perfect cup of coffee for one. Holds approx 2 cups. pot is 4"h with lid. x 7" With filter unit 6"h.